Payment Banks is the concluding part of the series. As a prelude, may I suggest, to read part one of this series, ‘How wallet helps in Last Mile Banking’. There has been a surge in the number of digital wallet service providers which have started offering their own Payment banks. It is the right pursuit for India to bring around 300 million unbanked individuals to the mainstream monetary flow. Being hailed as a major push for financial inclusion in the country, the RBI granted ‘in-principle’ approval of setting up Payment Banks. “This expands the horizon of financial inclusion in the country. The chain reaction is visible now and the habit of dealing only in cash is gradually changing. We are all nudged into a system where convenience and security require switchover”. These are the new entities formed by the RBI keeping in mind the needs of small-scale businesses, low-income households, and vast migrant labor population. They are mostly like the traditional banks, with few key differences. The main difference is that they have a current deposit limit of 1 lakh per customer, unlike normal banking which holds no limit on deposits. Payment Banks caters to the customer’s banking needs through mobile/SmartPhones rather than traditional ‘brick and mortar’ branches. One can avail services such as net banking, mobile banking or getting an ATM or a debit card. They cannot, however, provide their users with credit cards or give loans. ‘Banking on each other’ these payment banks have collaborations with large-scale banks, allowing their users to make transactions via their ATMs and offer other financial services. They also offer interest on the deposits made in the savings account, with the mandatory minimum being 4% as per RBI guidelines. RBI issued licenses for opening these payment banks to only 11 out of 41 applicants. Bharti Airtel was the first one to open live payment bank in March 2017 followed by PayTM and India Post. RBI ensured that this initiative serves it’s intended purpose by making a rule that 25% of the total branches of payment banks must be in rural, unbanked areas. Why are Payment Banks in vogue? Despite the strict guidelines issued by RBI and the limit on earning model due to no lending, payment bank’s licenses are still being sought out by the biggest names in the industry. With India being on the verge of being a digital country, payment banks offer the reach that traditional banks cannot. Almost everyone keeps a Smartphone nowadays, which are becoming a one-stop solution to all needs of a person, this was bound to happen. 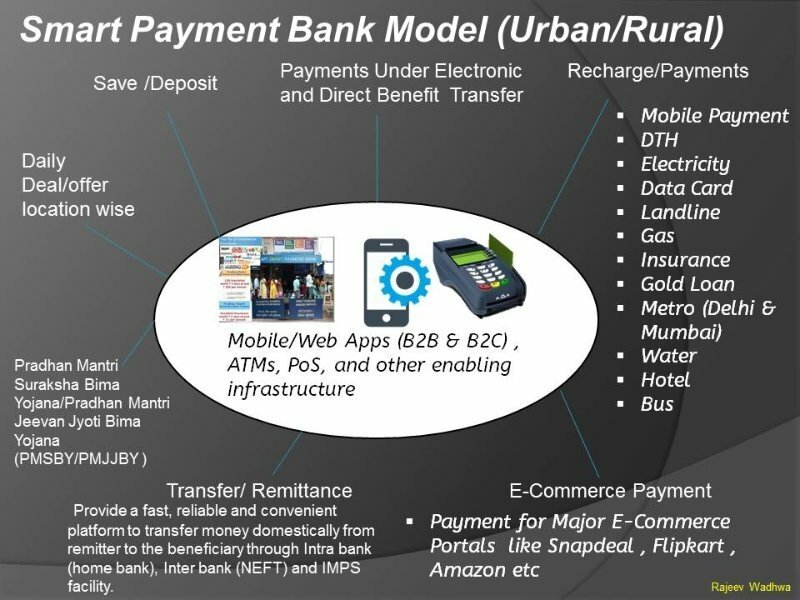 Payment banks are taking further what digital wallets started, i.e., cashless economy. Why should you welcome Payment Banks? Ever since mobile set and data became affordable and the government started taking up more initiatives for providing financial inclusion to the last mile, the way people handle their financial transactions has started to evolve. With Payment Bank entities giving a further boost to ensure better financial inclusion, it’s a step forward to include ‘one and all’. Providing more than ‘core services’ anytime – anyplace, payment banks are hailed as a much-needed step in the direction of financial inclusion for the last mile. Each of the Payment Banks had a distinguished advantage prior to opening their respective payment banks. They are now, trying to make it to the top in this race by drawing the best out of their already established resources, and reach amongst people. The first to open its payment bank, Bharti Airtel was also the one to provide the largest interest rate on deposits in its initial days. Airtel has about 1.5 million retailers across the country which can serve as banking points too, in future. At present, there are about 4 lakhs of such banking points which is more than the number of total ATMs in India. It has UPI transfer feature in it for transfer of funds between various bank accounts. Along with a MasterCard, it also provides a digital debit card without any charges. Opening an account is very easy and happens almost instantly. You can do so with the help of your Aadhaar card and fingerprints only. It provides free accidental insurance of 1 lakh to all its account holders and 5.5% interest rate per annum. When you open an account with Airtel Payment Bank, your mobile number becomes your account number. PayTM has the largest customer base for digital banking via its wallet. It gives an interest rate of 4% and targets having 1 lakh outlets all over the country by the end of 2018. With PayTM payment bank, you can open a zero balance account. It also provides fixed deposit facility along with a free digital Rupay debit card. You can also get a physical card for an applying fee of 125/- with 100/- maintenance per year afterward. With PayTM Payment Bank, you get a free insurance cover of 2 lakhs when you open an account. You can open an account by simply downloading the app. But to be able to use all the features completely, you have to get your KYC done. India has more than 1.5 million post offices all over the country, about 90% of which are in the rural areas. 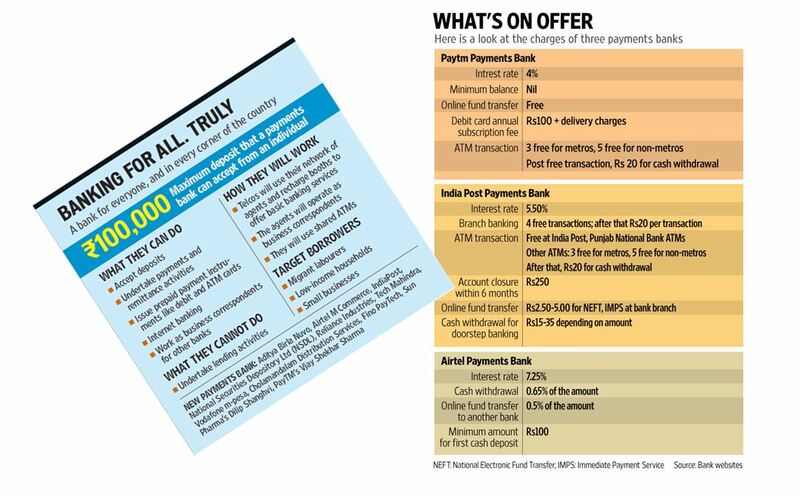 This puts India Post payment banks at an upfront as compared to others. It is also most capable of achieving the goals of RBI with the payment banks initiative. Right now, it is in beta testing phase at 650 post offices only, but the government is planning to make it available at all the post offices in the near future. Provides a variable interest rate from 4.5% to 5.5% depending on the deposit amount. It also provides a zero balance account opening feature. If you have a savings account with the post office, then you can convert it to a payment bank savings account making you further eligible for the better interest rate on your savings. Another feature that will be there in future is the ability to make cash deposits and withdrawals from the comfort of your home. The government might double up the role of postmen and charge for this service. Fino is not focusing much on advertising but makes up for it by providing more services and features than all of its competitors. They have 410 branches, 25,000 banking points, and are also present at BPCL petrol pumps in India, the first, to go live with all of the branches and banking points, on day one. Requires a minimum balance of INR 1000/- in the account. 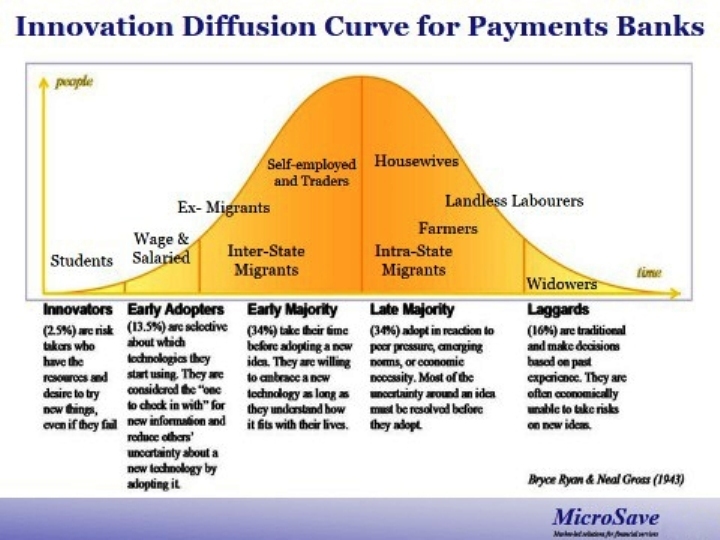 Its main focus feature is remittance for which it charges 1% fees. Likewise, Paytm it provides an interest rate of 4% per annum. It provides various other features & services like business correspondent loans, life and general insurance, bill payments, along with term deposit, auto loan, personal loan, and home loan via ICICI bank. Has the partnership with various banks to provide gold loans too. The Customer is KING. With the emergence of new players in this market, competition is only bound to increase. With an increase in competition, the customers will enjoy the benefits of it. Each of them is trying to be better than their competitors by offering their customers various features and services which users can avail from the comfort of their homes. The unbanked population has remained outside the periphery of participating in the economic system to reap the benefits of growth and economic prosperity. Always mobile, hard working and eternally caring for the families, this workforce needs recognition. This is not about financial inclusion but about the financial legitimacy of the recognition for the efforts. The banking system is the second step in this journey, with employment being the first. Payments banks can strategically use technology and smart segmentation as disruption tools and tactically leverage their existing customer base and distribution channels to quickly acquire critical mass. This calls for quick collaborations with new age disruptors, optimization of resources, continual pivoting and regular engagement with RBI to evolve the rules. Rightly said, Payments banks will alter the way transactions take place and they will complement banks, not compete with them.